Within minutes of being drafted, Andrew Luck and Robert Griffin III had their first NFL football cards officially revealed. 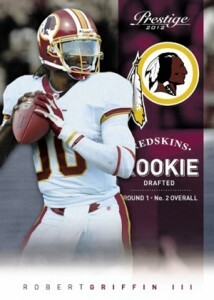 After introducing several sets with mock-ups using generic uniforms, both Topps and Panini wasted no time in showing off football cards of the two top picks in the 2012 NFL Draft in their new threads..
Panini's first cards come from 2012 Prestige Football. 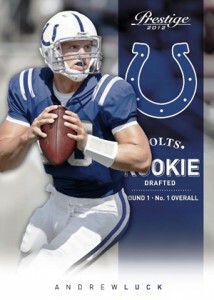 Releasing in June, the base set has 100 rookie cards that are inserted at a rate of one per pack. 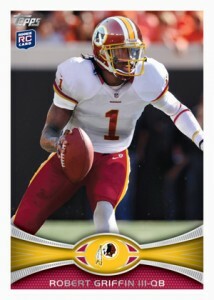 Topps had Luck and Griffin base cards for their flagship 2012 Topps Football, which is schedule to arrive in August. 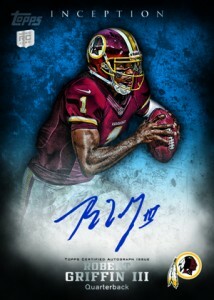 They also had autograph cards of both players slated for 2012 Topps Inception, which comes out in July.